London 1937, photographer: Geoffrey Collings, National Gallery of Victoria. Dulcie May Wilmott was born in Adelaide, South Australia in 1909 to Mabel and Josiah Percival Willmott, a school teacher. From about 1926 to 1932, Dahl studied at East Sydney Technical College under Rayner Hoff and attended painting classes at the J.S. Watkins Studio Art School. Her career began at Anthony Horderns and Sons in 1928, providing illustrations for the house magazine Horderian Monthly and the firm’s catalogues; she also did freelance work for other Sydney department stores, Farmer and Company, and David Jones, and designed covers for The Home magazine published by Sydney Ure Smith. In 1933 Dulcie Wilmott married Geoffrey Collings (1905–2000); they had two daughters, Donna (b.1937) and the artist Silver Collings (b.1940). She and Geoffrey worked collaboratively for most of their lives, co-signing the majority of their work ‘Dahl and Geoffrey Collings’; the name Dahl having been coined by Geoffrey as a term of endearment. One of their first works signed jointly was a 1934 cover design for The Home magazine. The Collingses travelled to London via Spain in 1935 taking many photographs and making their first documentary film in the medieval town of Alquezar in the Catalonian region of Spain. In London, Dahl worked as a freelance designer until Lazlo Moholy Nagy offered her a job in his studio working on the Simpon’s Piccadilly project in 1936. There she gained first-hand experience of European modernism and of Moholy Nagy’s and Gyorgy Kepes’s approach to design which she and Geoffrey embraced wholeheartedly. Dahl remained life long friends with Laszlo Moholy-Nagy and his wife Sibyl, and György Kepes and his English girlfriend, Juliet Appleby. While living in England, Dahl and Geoffrey Collings travelled to France and into Europe. Their first child Donna was born in London in 1937. With Alistair Morrison, Dahl and Geoffrey organised the Three Australians exhibition at the Lund Humphreys Gallery in 1938 to show their British work with an introductory catalogue essay by E. McKnight-Kauffer. They returned to Sydney in December 1938 via Martinique, stopping in Tahiti for three months to make their second documentary film Tiare Tahiti about life in contemporary Polynesia. In 1938, they returned to Sydney and attempted to introduce modern design to Australia; Dahl being one of the very first Australian women to begin the slow process of introducing modern art and design principles to Australian industry. The Collingses mounted their Exhibition of Modern Industrial Art and Documentary Photography at David Jones Art Gallery in 1939 and, with Richard Haughton James, established a commercial and industrial design studio, The Design Centre. Dahl exhibited with the Contemporary Art Society and the Australian Commercial and Industrial Artists’ Association, winning (with Geoffrey) four ACIAA awards in 1940, the year their second child Silver was born in Sydney. She also painted murals for the Accountants Club, Kings Cross restaurants and a kindergarten in the Blue Mountains in the early 1940s. It was around that time, that Dahl and Geoffrey Collings collaborated with Alistair Morrison, Douglas Annand and Elaine Haxton to produce the ‘Temple of Beauty’ display for Woman magazine at the Royal Easter Show. 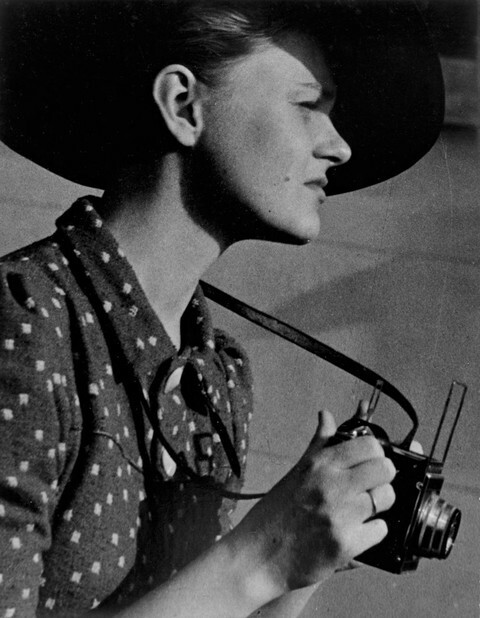 During WWII, Dahl Collings worked as a fashion artist and designer on Woman magazine where Geoffrey had been Art Director, while Geoffrey joined the Camouflage Unit of the Department of Homeland Security. She also continued to work freelance, designing covers for Sydney Ure Smith’s new journal, Australia National Journal and producing designs for Elizabeth Arden, David Jones, Qantas, the Orient Line and Woman magazine. Dahl was costume and set designer for the Ealing Studios films, The Overlanders (1946) and Eureka Stockade (1949). Her paintings of Charters Towers were published in the final issue of London’s Lilliput magazine in 1950. She designed posters for the Orient Line and later, fabrics for the SS Oronsay ocean liner. In 1950 the family moved to New York. Dahl became a design consultant to the Australian Trade Commission, in charge of the Australian Display Centre in the Rockefeller Center, while Geoffrey was Pictures Editor for the United Nations. There she also undertook some freelance work, such as drawings for Harper’s Bazaar. Back at Sydney in 1953, the Collingses moved into their newly built house in Castlecrag, designed by the architects Baldwinson and Booth. They established the Collings Production film company and many of the films they produced and directed won international awards. Dreaming, a film produced for Qantas about Aboriginal art, won one of the five special diplomas (the top award) at the 1964 Venice Biennale Festival of Art Films; their Opera House film, Job No.1112 was awarded a silver medal at the 1975 Festival of Architectural Films in Madrid; and the series of documentary films they made for Qantas on Australian artists Sidney Nolan, Russell Drysdale and William Dobell in the 1960s were also well received. In 1970, Dahl and Geoffrey Collings moved to Killcare Heights on the New South Wales Central Coast. From 1971 Dahl devoted herself full time to painting. She had solo shows at the Bonython Gallery (1976) and Holdsworth Gallery in Sydney (1977) and at the City of Hamilton Art Gallery in Victoria (1982). Dahl died in 1988. Geoffrey died in 2000. Anne-Marie Van de Ven, Curator, Museum of Applied Arts & Sciences, 2012. This biography was sourced from the Powerhouse Museum Collection. Under Creative Commons License: Attribution Non-Commercial.